Living in the present is a powerful and joyful way to live your life. When we move away from living in the present moment and focus on how we wish past events could have turned out or simply relive them, or worry or fantasize about the future, we get lost in our thoughts and mind. Living in the present moment allows you to experience life as it happens, let go of worrying about the future, and start to let go of old patterns or responses that are rooted in the past. When you first start to observe your thoughts and notice how much time you spend thinking about the past or future it can be shocking. You’ll wonder why I am back to this same moment in time again. When you’re focused on the present moment you start to notice the people and your surroundings with a new alertness and joy and deal with issues or problems that arise in an empowered and effective way. 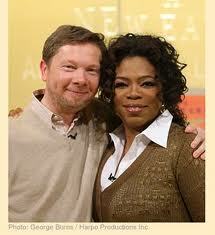 Eckhart Tolle with Oprah Winfrey on set of the New Earth web series. Give the first episode a try. Remember too that living in the present is a practice and a process. You’ll start out just noticing your thoughts and then begin shifting from past/future thinking to living in the present. It takes some time so be patient and kind with yourself. To start out I recommend noticing your thoughts when you’re doing something on autopilot, like showering, and seeing if you can stay focused on what you’re doing and experiencing in the present (smell of your shampoo, sensation of hot water) and stop those thoughts about what you have to do next or something that happened the day before. Just being aware of your mind patterns is a huge huge step and accomplishment.